Constellium is a world leader in the manufacture of aluminium products and solutions with plant facilities located in North America, Europe and Asia. 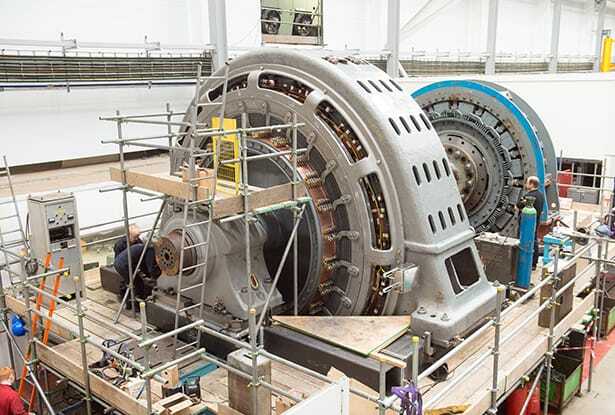 They were experiencing commutation issues with the main mill drive motor at one of its aluminium mills in France. In order to maintain production the defective armature was replaced by Quartzelec with the client’s spare unit which allowed the faulty armature to be transported back to Quartzelec’s workshop facility in Rugby for rewind, which in itself presented many challenges, as special permits were required to transit the 7m long, 4m diameter, 68 tonne armature through France and the UK. The project initially was to rewind the armature, following a thorough clean and testing of existing components. The scope however was significantly extended to a re-core prior to rewinding, together with refurbishing and rebuilding of the magnetic frame and brushgear and other necessary work. Testing the motor comprised a major part of the project as the customer required us to demonstrate the machine’s overload capabilities against a very tight specification. Results considerably exceeded expectations, with overload current measuring 8500A in both directions against an initial design specification of 3800A. We also performed black band testing on the commutator and magnetic saturation curves, again exceeding expectations. Testing Constellium’s unit involved a temporary extension of our test facility, including the design and manufacture of a rigid support for the motor on live test. Following successful testing, the completed armature was returned to the mill in ahead of schedule.